Home News Reports Rahul Gandhi's one fixed rate for GST - is this his or Pidi's idea? Rahul Gandhi’s one fixed rate for GST – is this his or Pidi’s idea? Rahul Gandhi could just be the gift that keeps on giving. After giving us multiple lies and sexist jibes during the Gujarat elections campaign, Rahul Gandhi has given us an example of his confused state of mind. Politics seems to be in his shirt, in his pants, but sadly not in his brains. We all know Gujarat is an industry heavy state. Gujaratis are known to be very good at business. So its natural for any politician to appeal to the business community there, since they are sizeable in number. But Gujarat, like other states, also has farmers, ordinary village folk, who are not economically well off. Thus, pushing the “pro-poor” image also makes sense. A shrewd politician would try to appeal to both segments, without getting caught in the areas where he may face a conflict of interest, between the interests of the business community, and the interests of the poor people. But Rahul Gandhi is not a shrewd politician. India does not need a Gabbar Singh Tax. We want a true GST. Congress, along with the people of India, fought for and ensured reduction in items in 28% bracket. Next we will fight for one rate, with a cap at 18%. If BJP doesn’t do it, Congress will. While its a welcome relief that Rahul does not want all goods to be taxed at 18%, one single rate for all goods, whatever it may be, could still be a problem. This number will only increase after we factor in the latest massive changes in the rate structure. Most of the items in this list are essential commodities like articles of food, clothing, medicines etc. 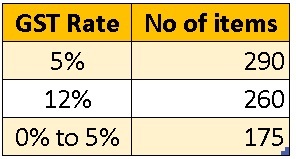 If Rahul Gandhi’s mystery proposed single GST Rate is above 12%, does the anti-suit-boot-ki-sarkar, the pro-poor Rahul Gandhi want to to tax all essential items currently enjoying rates between 0% to 12%, at a higher rate? Has he just promised the Indian populace that he will increase the taxation on more than 50% of the goods in India? If the rate is below 12%, it certainly cannot go below 5%, thus he still increases the taxation on a substantial number of goods. If the rate is too low, i.e. below 12%, all the luxury items, the sin goods, will also be taxed at this single mystery rate. Cigarettes, luxury cars, tobacco products, aerated beverages, all will be taxed much lower, seeing a massive drop from the current rates which are in excess of 28% GST (after including compensation cess). Is this what the knight in torn clothes supposed to do? If Rahul Gandhi is allowed to execute his plan Moong Dal will be taxed at the same rate as a Mercedes car. Chana Dal at the same rate as Cigarettes. His favourite Alu will be taxed at the same rate as Aerated drinks. It will most certainly be a rate increase for Moong Dal, Chana Dal and Alu, but a massive drop for rate on luxury cars, cigarettes and aerated drinks. If BJP wants to win Gujarat 2017, Lok Sabha 2019, or practically any elections in India for the foreseeable future, they just need to keep reminding people that Rahul Gandhi has sworn to increase the tax rates on over 50% of the goods in India, and to tax essential goods on par with luxuries. Rahul on the other hand needs to speak less probably. Is this really his idea or Pidi’s? On Monday, Rahul Gandhi was forced to apologize before the Supreme Court for attributing his own misguided opinions to the highest court of the country.